Granatelli knew how to promote. 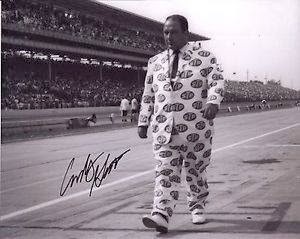 Andy Granatelli, the flamboyant former CEO of STP who won a pair of Indianapolis 500s, promoted a series of wildly successful stock car programs at Chicago’s Soldier Field and helped make Richard Petty a household name, died Sunday of congestive heart failure in Santa Barbara, California, at the age of 90. In 1961, Granatelli was named president of Chemical Compounds; a company with just seven employees and one product, STP. In 10 years under his guidance, STP grew to more than 2,000 employees and sales of $100 million per year. In 1972, he teamed STP’s familiar’s “Racer’s Edge” decals with NASCAR driver Richard Petty, beginning a sponsorship relationship that led to seven Winston Cup Series championships. The deal nearly fell apart when Petty insisted on adding his familiar Petty blue to STP’s day-glow red color scheme, but Granatelli eventually relented. "Stick with me," he promised Petty, "and one day, you'll be as famous as I am." Under his leadership, STP spent upwards of $20 million a year on motorsports marketing, a fortune in 1970s dollars. They became one of the first national companies to advertise on Motor Racing Network radio broadcasts of NASCAR racing and their "Welcome Race Fans" banners blanketed speedways from coast to coast. While Petty’s dominance helped pushed NASCAR to new heights of popularity, Granatelli’s free-spending ways eventually led to his departure from the company in 1973. "Everything he did was bigger than life," said son Vince Granatelli this week. "The thing that gave him the most gratification in his life was what he did at the Indianapolis 500." "Andy Granatelli understood better than anyone the spirit and challenge of the Indianapolis 500,” said Indianapolis Motor Speedway President J. Douglas Boles this week. “(He) had a remarkable ability to combine innovative technologies with talented race car drivers to make his cars a threat to win at Indianapolis every year. Andy leaves a legacy of historic moments that will live forever in Indianapolis 500 lore." A member of the International Motorsports Hall of Fame, the Motorsports Hall of Fame of America and the Indianapolis Motor Speedway Hall of Fame, Granatelli is survived by his wife, Dolly, and sons Vince and Anthony. Norm Desjardins Opens "The Body Shop"